Michael Dale O'Brien (Formally of Narrow Road) has a new sound and a new CD. The edgy Acoustic Rock Sound of the past has changed to a blend of up-beat Acoustic Contemporary with a large splash of Praise and Worship. Michael Dale O'Brien performs in concert regularly at several Christian coffee houses as well as other Christian owned and operated restaurants in the San Antonio area, including The Lighthouse Coffee & Café, The Upper Room in New Braunfels, & Harmon's Barbeque in Cibilo. They also play for church services, Singles and Youth Meetings, Weddings, Seek the Lost Ministry to the homeless, Fund Raisers and many other Christ centered events. Michael has been a Worship Leader for the past 13 years. In preparation for this ministry Michael earned his Bachelor's degree in Music Education from the University of Texas at San Antonio. Michael has toured the United States and South America. Michael has released 3 CD's since 1992 including his latest release in 2004 "Send Me"
His sound appeals to all ages and the lyrics of the songs speak straight to the heart from God's word. Our Mission: We believe we are called by God to share the Gospel of Jesus Christ without compromise to lost and hurting people through music and testimony. We also believe we are called to lift up and encourage those who are already in the family of God. "... a very spirit filled Christian band. We have been blessed to have them praise the Lord through their music at our church several times. Alive in Jesus brought tears to our eyes because it was so spiritually uplifting." "... Michael Dale O'Brien has provided a music ministry in our cafe for five years. Their extraordinary versatile performances surpasses nationally known Christian artist... a real blessing for our business and for us personally." 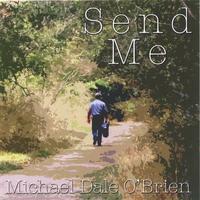 "... Michael Dale O'Brien's music and leadership style is genuine and worshipful. When they were with us, they joined excellent technical skill with heart-felt singing and song leading that fed our congregation." "I have known Mike for more than twenty years and been awed not only by his talent but by his spirit as well. In all my years of professional gospel music I can say that it has been rare to find someone of his talent that has such humility and moves in the power of God." This album combines experience and musical expertise with, an always fresh, raw talent. As an artist, I can appreciate the dedication to the gospel Michael has devoted his talent to. This is a project that is timeless in message and style. Rock solid accoustic tracks with incredible vocals! A cross between Dan Fogelberg and James Taylor. This cd defines easy listening. With a message that moves. A must have for any Christian music lover!